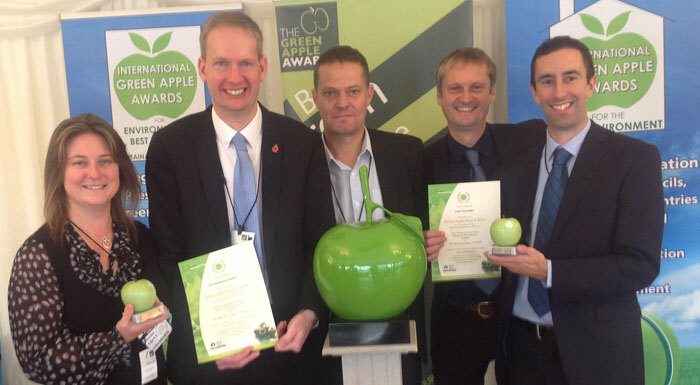 The Medmerry scheme won a Green Apple Environment Award in November 2014 (see pic above). At that time the Green Apple Award judges said: “Coastal realignment and sea defences are becoming a sustainable option now, due to rising sea levels and other economic challenges. As a result of the Green Apple success, Team Van Oord was invited to have its award-winning submission published in The Green Book, the world’s only annual work of reference on environmental best practice which is distributed to environment professionals, universities and libraries around the world. It will also be submitted in the Green World Awards 2016, where the top prize is to host the global presentation ceremony in the winner’s homeland. The scheme, which involved the construction of four miles of new sea walls to reduce the flood risk to hundreds of properties on the West Sussex coast, has been the subject of universal acclaim since it opened in November 2013. It has created a new wetland for wildlife to flourish and much of the site is now managed by the RSPB as a nature reserve. In total the Medmerry Managed Realignment Scheme has received no fewer than16 industry awards in the past 18 months.